What is supervision? Supervision is a space for regular protected time for facilitated, in-depth reflection on your coaching practice along with experimental learning. It is recognised as playing a vital role in coaching development, coach resilience (‘bounce back ability’) and CPD. Supervision is for people who work with people. It is a structured process for YOU, the coach to reflect on your practice. Just as a coach can help maximise the performance of a coachee, a good supervisor helps maximise the coach’s performance through supervision. On a more human note supervision is an unfortunate word applied to this reflective practice and experiential learning, as the term ‘supervision’ has tones of being watched over and corrected. However if you split the word in two, super and vision, the process becomes clearer, super – overall helicopter view of your practice and vision – you the coach get a vision or an alternative perspective on your practice. In order to ensure that the supervisee has a safe place for supervision and gains the maximum benefit from the supervision sessions, Maeve uses (amongst other techniques) The 7 Eyed Supervision Model (Hawkins, P., Shohet, R., Ryde, J. and Wilmot, J., 2012). • Normative – the supervisor accepts and shares with the supervisee the responsibility for ensuring that the supervisee’s work is professional and ethical. 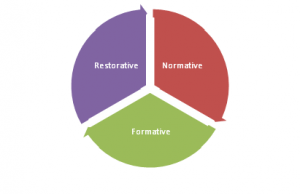 • Formative – the supervisor acts to provide feedback and/or direction that will enable the supervisee to develop the skills, knowledge and personal attitudes etc. ensuring the supervisee works at becoming a more competent coach. • Restorative / Supportive – the supervisor listens, supports and draws the supervisee’s attention to any personal issues, doubts, ethical issues, and any other supervisee issues that arise. These three factors develop in coaches an in-depth reflection of their coaching practice along with their own experimental learning. Organisational / in house supervision – because your organisational health matters. This can be done on an individual and/or group basis or a combination of both. What is a supervisee? 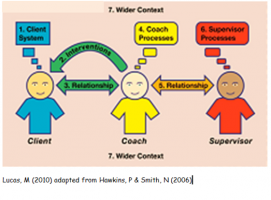 A supervisee is a person or coach who comes to the supervisor for supervision. Why should I bother with supervision? Supervision is regarded as best practise. Most supervisees who attend regular supervision sessions are aware of an added bonus to themselves as coaches, to their coaching practise and their clients. Other benefits can be found in a report published by Hawkins, P.; Schwenk G., Chartered Institute of Personnel and Development (CIPD ) 2006 called Coaching supervision Maximising the Potential for Coaching . • Enhances your own practice by challenging you as a coach • Helps the supervisee to become more self-aware. Maeve Finch of Total Focus Maeve was awarded a Higher Diploma from Middlesex University studying with Dr, Michael Carroll, (one of the most recognised global supervisors and trainer of supervisors). Maeve supervises professionals in the coaching industry and also those in other ‘helping professions’ in Ireland. She keeps up to date with supervision competencies by attending a supervisor for her own development & CPD, in-depth reflection and experiential learning.